IF YOU ALREADY OWN A TASCAM HD-P2 YOU MAY STILL PURCHASE SOME OF ITS ACCESSORIES FROM OUR HD-P2 WEBSHOP BELOW. Answering the call of remote recording engineers, the HD-P2 is the professional solution for the challenging requirements of live and on-location applications. It writes uncompressed Broadcast Wave audio files at up to 192-kHz/24-bit resolution for audiophile quality to CompactFlash (CF) or Microdrive media. Files are instantly available through the built-in high-speed FireWire computer connection and can be loaded into DAW projects with sample accuracy. Unlike consumer MP3 sketchpads, the professional HD-P2 incorporates high-end features like SMPTE timecode and clock input for synchronization to video recorders or other external devices while in record or playback. Its XLR microphone inputs include phantom power and a limiter to curb unpredictable distortion during live events. The user interface has been designed for fast and intuitive use under stressful one-take-only situations, and with its large, angled LCD, the HD-P2 is perfect for any application from over-the-shoulder location recording to concert recording and commercial use. The shoulder-slung design of the HD-P2 with its included locking strap makes it a natural choice for film production recording. The CompactFlash media is safely recessed and latched to prevent accidental ejection, and audio can be recorded locked to timecode and video reference for absolute lock. It runs for approximately 5.5 hours on readily-available AA alkaline batteries, and weighs less than two pounds with batteries installed. At the end of the day, recordings can be instantly transferred to an editor through the FireWire jack or a CF reader for use in a non-linear editor to sync dailies or to conform dialog during post. The HD-P2 records in stereo from 44.1kHz to 192kHz, at 16- or 24-bit, to affordable CompactFlash (CF) media. Not only is CompactFlash absolutely silent, so no transport noise will show up on your recording, but the recorded audio is written directly as Broadcast WAVE (WAV) files for immediate use in digital audio workstations. The unit even includes a FireWire jack for the fastest possible transfer of files to your PC or Mac computer. On the input side, the unit has a pair of XLR mic inputs with phantom power and analogue peak limiting to curb distortion during unpredictable live events. The input level control allows the user to change the level without taking their eyes off the action. The HD-P2 also features unbalanced RCA ins and outs as well as SPDIF digital I/O. Monitoring is available through a headphone out - again, with its own ergonomic level control - using a built-in speaker. A built-in microphone is also provided for interviews and educational use. 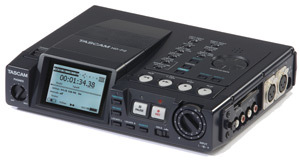 TASCAM's HD-P2 comes standard with a full-featured timecode input - making it the most affordable recorder with built-in timecode ever made. Incoming LTC is connected to the locking XLR input for timestamping your Broadcast WAVE (WAV) files from a central clock. Not only does the recorder timestamp your recorded audio with sample accuracy, the HD-P2 chases incoming timecode during playback for review or loading into an editor. A video clock input allows frame edge resolve to a central blackburst source or use as a lock-and-release timecode slave. There's also a freewheel setting for use with unpredictable timecode sources. For maximum compatibility with the post production world, the HD-P2 supports pull-up and pull-down sample rates, even at high-resolution settings. The video clock input accepts tri-level sync for high-definition television (HDTV) production. The HD-P2 192kHz/24-bit recording resolution is so precise, you can almost hear what brand of cork was used for the conductor's baton (it says here in Tascam's charmingly American literature). The high-quality mic preamps provide phantom power to handle sensitive condenser microphones, and the analogue limiter protects the recording against sudden transient distortion. With the high capacity of today's CompactFlash media, you'll even be able to enjoy the performance without constantly watching the time remaining meter. With professional connectivity, built-in synchronization, high-resolution recording and Compact Flash convenience, the HD-P2 is the professional solution for serious recording in a reliable, portable package. The following chart provides approximate recording times for the HD-P2. To use the chart, first find the audio resolution you plan to record in. Move down the chart to find the length of recording time you need. Then move left to see what size CompactFlash card you'll need to use. SPDIF digital input and output (coaxial) - record from digital sources, transfer your recordings digitally to any mixer, recorder etc.